An Al Jazeera documentary released over the weekend suggested that Peyton Manning may have used banned performance enhancing drugs, but the reporter who anchored the film said Tuesday that it did not accuse Manning of anything. Deborah Davies, the reporter behind Al Jazeera's "The Dark Side: Secrets of the Sports Dopers," said on the "Today" show that the documentary's primary source only accused Peyton Manning's wife, Ashley, of receiving shipments of human growth hormone. "That's it," Davies said. "That's the allegation." "Today" show co-host Savannah Guthrie pressed Davies, saying that the documentary attempted to "suggest something larger" about Peyton Manning possibly using a substance that is banned by the NFL and severely restricted under law. Davies replied by noting that Manning, who has denied using HGH and said he might sue Al Jazeera, hasn't denied that his wife received the growth hormone shipments. "I have not seen a denial," Davies said. Later in the interview, she repeated, "We are not making the allegation against Peyton Manning." 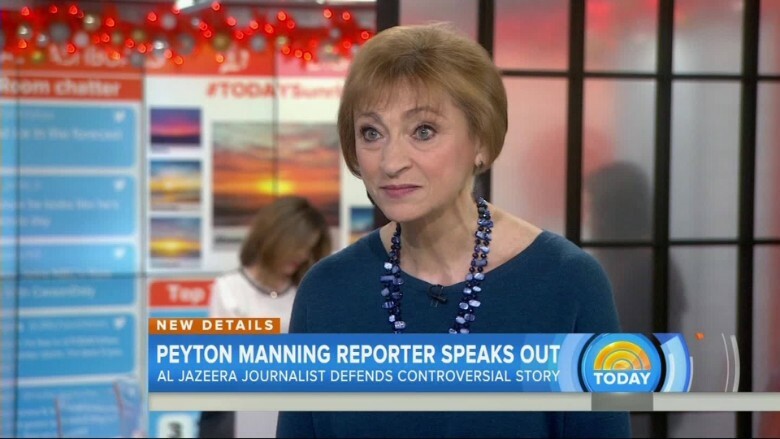 Ari Fleischer, the former White House press secretary who is serving as a spokesman for Manning, said that "Al Jazeera is backtracking and retreating." "Their story was not credible to begin with and it's not credible now," Fleischer said in a statement. "Within 48 hours of the broadcast, Deborah Davies is now contradicting her own reporting." Davies' statements on Tuesday struck others as a retreat. ProFootballTalk's Mike Florio wrote that Al Jazeera is "suddenly working hard to backpedal from the thrust of its report." The Indianapolis Star's Matt Glenesk said that "you can't really backtrack any more than" Davies did during the interview. Davies denied that she was backpedaling. "That's really stupid," she told CNNMoney Tuesday morning. "That's people not understanding it to start with." Davies said that Al Jazeera isn't "changing anything" and that her investigative team stands by "everything in the program." Anyone who construed her comments as a shift, she said, has been misinformed. "When you have a big story that's out there, other people report on it. They get stuff wrong," Davies said. "Other people pick that up. They get stuff doubly wrong." Davies said that Al Jazeera is working on follow-ups. "There are going to be some huge developments on this story," she said. "The Dark Side" clearly raises questions about Manning, one of the most accomplished quarterbacks in NFL history who is beloved by millions. But Davies is right that the film's primary source alleged that the HGH was shipped to Manning's wife. In the documentary, Charlie Sly, an alleged drug supplier who worked at the Guyer Institute, said that the Indianapolis-based anti-aging clinic only sent drugs to Ashley Manning. "Like growth hormone, all the time, everywhere, Florida," Sly said on the secretly recorded tapes. "And it would never be under Peyton's name, it would always be under her name." But at various times throughout "The Dark Side," Davies connected Sly's allegation to Peyton Manning. 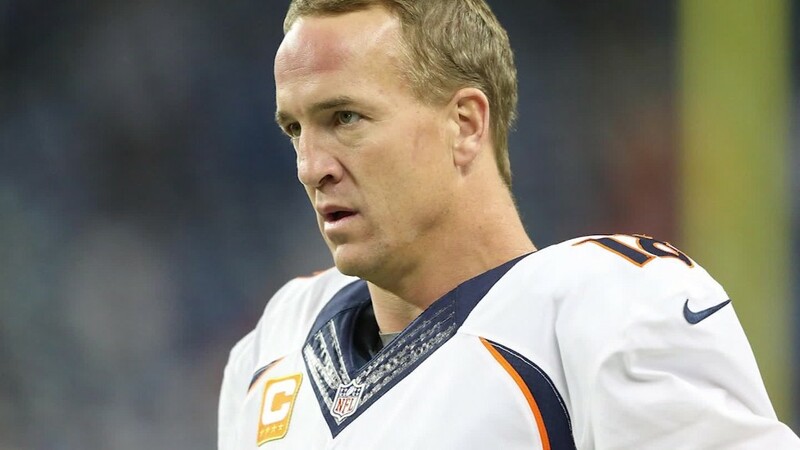 Near the beginning of the film, Davies said that the claims "raise questions" whether "Peyton Manning is linked to performance enhancing drugs." "Charlie Sly's claims would involve many other top players, but his most astonishing allegation concerns an icon of American sport," Davies said at another point in the documentary, as Manning's number 18 jersey appeared on the screen. Davies and her team noted in the film that there are only three conditions for which HGH can be legally prescribed: growth hormone deficiency, short bowel syndrome and HIV wasting. On the "Today" show on Tuesday, Davies wondered for what purpose Ashley Manning would receive HGH. "Don't reveal your medical condition. That's very private," Davies said. "But confirm that you do not suffer from one of the things for which it's legal to prescribe it." Sly has recanted what he said while being filmed undercover in "The Dark Side." Both Sly and the Guyer Institute have also said he did not work at the clinic in 2011 when the drugs were allegedly sent to Manning.